PostalExam473.com Reviews - Legit or Scam? PostalExam473.com Reviews – Legit or Scam? 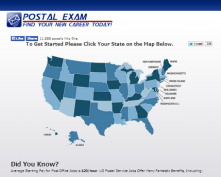 PostalExam473.com is a website that promises to help people prepare for and successfully take the exam required for people seeking possible employment with the Post Office. This exam measures your ability in four different areas: checking addresses, completing forms, coding practices and memory, and experience inventory and personal characteristics. PostalExam473.com goes out of their way to explain that their fee for practice materials is significantly lower than many of their competitors, which they quote at around $120, while their cost is only a one time fee of $39.97. To get started you must select the state in which you are hoping to work and then fill out a short questionnaire regarding your age, Citizenship status, previous education, and whether or not you have previously taken any entrance exams for the Post Office. Once you have completed the questionnaire you will need to pay a fee to receive your full practice materials, which will include a 200 page exam guide and several practice exams, with materials being updated on a regular basis so that users are always prepared for the latest exam versions. According to their website, 98% of people who use their practice materials are able to pass their postal exams on the first try, often within the top 90th percentile of all test takers. In case you are unhappy with what you receive from this company, they do offer a refund policy which states that if you are dissatisfied at any point during the first 60 days of your purchase, you must return all physical products that were shipped to you and delete all digital video, audio, and text files you have obtained, and then ask for a full refund. To request a refund you must first contact their Customer Service team, through two possible methods, either by email at [email protected], or by submitting any of your questions, concerns, or complaints directly to their website. There are some other companies that specialize in this type of exam preparation, like PostalJobReplacement.com, as well as preparation guides and books which can be purchased at bookstores. Average Rating for " PostalExam473.com " is 2.14 out of 5 based on 7 reviews. Glad I read this. I was so happy thinking I was about to receive a wonderful opportunity with USPS. But when they asked for money before anything else, I was skeptical. Once I read these reviews I’m not even going back. Thanks and sorry ya’ll got got. This is a major SCAM! Hey guys this website is a scam if you want to complain here is the contact. it was a horrible for me to lose my money for no good reason postalexam473.com woa be on to you. Did you receive any study materials in the mail? Or online? Thank you Shane. It sounded too good to be true which, of course, usually means that it it a scam. You saved me a lot of headaches. Can you be specific about contacting the trainer and getting the training materials. Can you supply a list of all of the training materials. Are they free? Si no hay Muchas objesiones por Que no ponen en la espanol el examen a realizar. I talk to 1 lady she said I have to paid $95 dollar . Do I have to pay? I also paid for the materials, got confirmation of payment but they sent the exam to my spam which I never check that was almost 2 months ago and now I can't find said exam anywhere. What kind of rip off is this? Does any person know who to call or send my complaint to?